We’ve made crypto mining accessible to everyone . We own and operate most energy efficient state of the art mining farm in iceland. Instead of offering investment opportunity to a few large investors, we allow individuals to be part of this crowd funded mining operation and share daily mining profit. 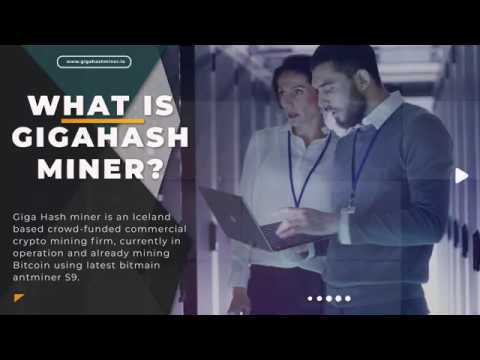 GigaHash represents a new, highly-evolved breed of enterprise, built around SMART,sustainable cryptocurrency mining, but encompassing renewable energy production, education,business development and support, and responsible business innovation. We own and operate most energy efficient state of the art mining farm in iceland. Instead of offering investment opportunity to a few large investors, we allow individuals to be part of this crowd funded mining operation and share daily mining profit. Being based in Iceland gives us the ideal opportunity to take advantage of the cool climate, strong winds (renewableenergy production), a uniquely tech-minded bureaucracy, and the cryptofriendly legislativeenvironment of the EU. Whilst cryptomining is far from the entirety of our focus, it is a keymonetary generator for the myriad endeavours encompassed by the GigaHash platform. For crypto mining, location is important, as the key factors determining the success of any cryptomining enterprise are local regulation, and climate. Mining is energy intensive, processing power means heat, heat means cooling, and cooling means expense. For this reason, the cooler the climate, the cheaper your mining operation. If you are looking for a combination of cold climate,affordable real estate, as well as cheap and reliable power supply, you will not do better thanIceland. Iceland is regarded as one of the most digitally advanced nations in the world. Apart from beingthe nation that gave us Skype and Transferwise, Iceland has by far the most highly-developednational blockchain based ID card system in the world. In fact, the country has had an openly-stated goal of becoming the first entirely digital nation, since the 1990’s. With the arrival of blockchain technology, they have found the key to achieving this, and have embraced it eagerly. No other nation on earth can claim to be as proactive in the blockchain and crypto space as Iceland. Far from being just another token though, GigaHash represents a watershed in theapplication of blockchain technology, not just for crypto mining, but as the foundation for a comprehensive,ethical enterprise built around renewable energy, financial education, and focussed,effective community programs in areas of extreme need. Our team consists of a group of crypto experts including investors, business and I.T. experts,programmers, technicians and others who have been dealing with digital currencies, ICO’s, crypto currencies and crypto currency mining for the past 5 years. Our goal is to give everyone theopportunity to participate and benefit in this rapidly growing market, and journey with us into anew era of financial transparency, personal wealth, and ethical, sustainable commerce. Intial round of private funding. Order of ASIC Miners. Launching of ICO (Round 1). Further expansion of existing facility.